I was really impressed by the technique demonstrated by Jan B in her tutorial on how to create a shadow box. Well I tried it out on a card - its a different technique to the one I used on a previous project and far more simple too. Here is a link to7 Jan's video for those of you who have not seen it yet. 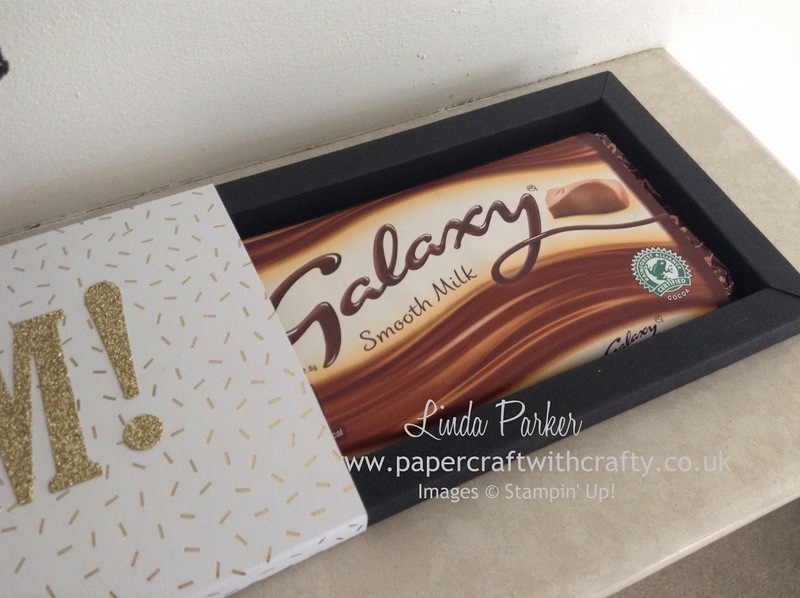 Anyway - I decided to use the basics for the shadow box to create a beautiful chocolate box for a large Galaxy chocolate bar and I am really delighted with how it turned out. I used Black 12 x 12 inch cardstock and made the wrapper/sleeve for the box using beautiful papers from the Pop of Pink 12 x 12 pack of Speciality DSP Pack. 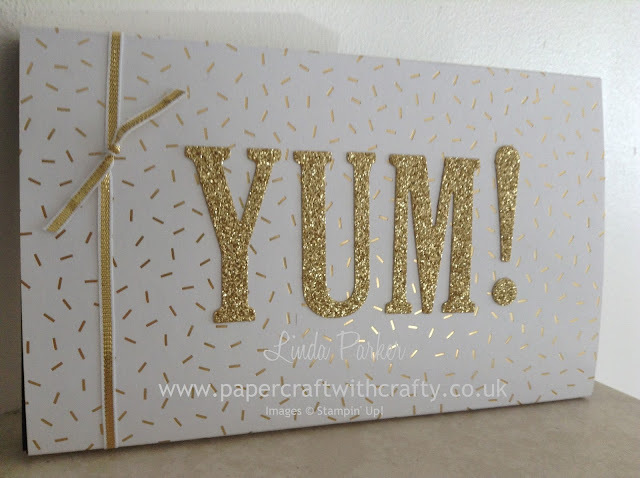 I die cut the word "Yum !" 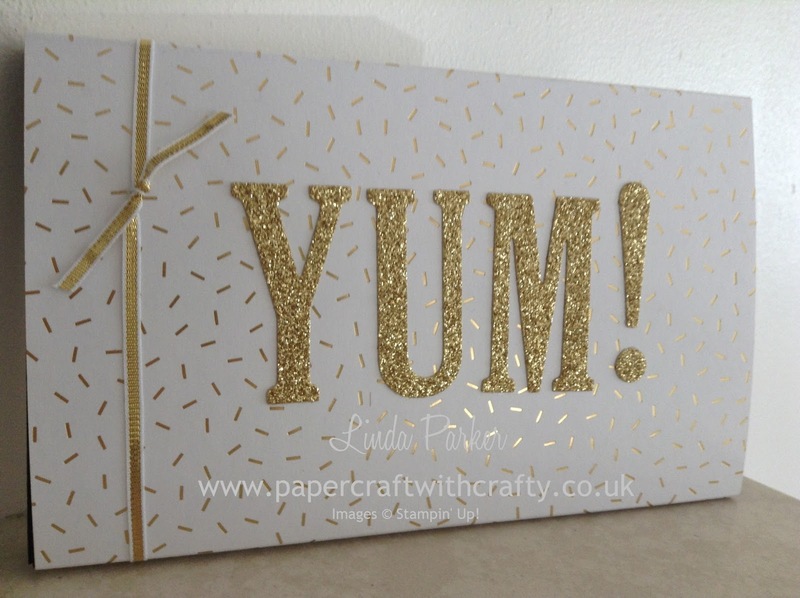 from Gold Glimmer Paper using the Large Letters Framelits Die. Now - yes these are expensive. But as a serious papercrafter who makes a lot of personalised cards and scrap book pages, I saw them as a great investment. I know I shall get so much use from them. I do hope you love the box as much as I do. I shall be adapting it for quite a number of upcoming projects. Hi Linda, I love this! Great for gift giving. Can you tell me the size (measurements) for the candy bar you used? I'm in USA and don't believe we have those Galaxy candy. I want to be able to find a chocolate here in US that will fit this box. Thanks for another great video. I love them all and you come up with great projects! Many thanks for sharing! !